Britain definitely has a culture of a sweet tooth. Sugar is common both as an additive to foods, as a central component of foods, and in other forms, like artificial sweeteners and suchlike. Sadly all too rare on the streets these days, an old-fashioned sweetshop was a common sight 10 years old, and the image of a wall of jars of sweets, available to buy by the quarter, is now a favourite reminiscence of the 30-something generation. Which are the sweets that Brits like to munch on ? What is the culture of sweet sucking, chewing, and eating that Britain is known for ? How did we get this sweet tooth ? Britain is a nation of chocoholics. From the Milky Bar (and the great accompanying advertising campaign that went with it - the Milky Bar 'kid'), to Wagon Wheels and through to the exclusive organic chocolate range of Green and Blacks, Brits cannot get enough of the brown gooey stuff. Imported from overseas by the barrel-load, chocolate and its various products has kept British chocolate makers such as the Birmingham-based Cadbury Bourneville at the top of their game for a hundred years or so. Chocolate has even inspired books, such as the much loved 'Charlie and the Chocolate Factory', written by the British-domiciled writer Roald Dahl. This has also been made into a film! There is such a range of chocolate available in the UK - not all of it made in Britain, that everyone, young or old, has their favourite bar, and most people can be bribed through chocolate! This is a classic British confectionery - it is virtually pure sugar! Made in the Cumbrian town of Kendal, it is an essential item to take when hiking. The sugar rush can really boost energy, albeit temporarily, and most hikers and wilderness walkers swear by its restorative powers. This is a timeless favourite for kids - the sharp citric taste of the sherbet, combined with the sweet/sour taste of the liquorice is a classic taste of British childhood.Some adults, or grown-up kids, profess a love for it as well ! 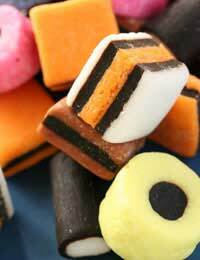 Liquorice has such a unique British flavour, many people simply can't stand it. Sharing this passion with the Dutch, who have taken this taste to soaring new heights, boxes of Bertie Bassett's Allsorts are divinely special to connoisseurs. These were the sweets beloved of elderly members of the family, who would send kids off to the sweetshop to purchase a bag of these delights. Quite a sophisticated taste for many kids, weaned on stronger, sweeter fare, but a good example of one of the delights available in the glass jars on that sweet shop wall. Uncle Joe's Mint Balls are a traditional product of Lancashire town, Wigan. Produced for more than 100 years, and still as popular as ever! Thankfully, these personal favourites are having a comeback at the current time, due to the efforts of Marks and Spencers making and selling them again. In the same way as the drink Dandelion and Burdock having little to do anymore with its original ingredients, its unlikely that any real fresh rhubarb or any heavenly custard got near to these sweets, as such flavours can be easily created synthetically nowadays, but the sense of these great tastes; a perfect combination lingers. This exemplifies what the British want from their confectionery : something that tastes of or reminds the buyer about Britishness - uniqueness and flavourful.